According to most of the people’s believe, a bathroom should only contain necessary things like for your hygiene and nothing else. As such most of the bathrooms are simple and while and well actually look pretty boring. However, this is the first room one does sees in the morning and the last one prior to going to bed. Therefore, considering to make it more renovating by using bathroom renovation tips for your dream space will definitely give you it a stunning outlook. You can update the look and functionality of your bathroom and make it improved by taking lot of factors into account. Since a typical bathroom represents small, moisture heavy, and clutter prone area, you can take time when planning to weigh your options. At best, you need to certainly be satisfied by all the physical needs and spiritual craving without blowing the budget. Here are some principles for a smart bathroom design for carrying your renovation process smoothly to your uttermost satisfaction. All bathroom renovation starts with a big checklist, but the biggest issue is the tight space. Now most of you’d want a big enough tub or shower, big sink and few extra-appliances and details. But that disrupts the traffic flow and space end up crowded. One solution to all this you can do by installing the sink in the corner. It will help you manage to come up with design freeing up space and letting you feel cosier. You can even put mirros on both sides of the corner for more angles that will help you to style you hair. Furniture always serves as an integral part of bathroom design. Fitted pieces are absolute options and they allow you to achieve a coordinated finish and look. However, to work in a smaller space like bathroom, you must plan from the start. On the other hand, you can choose to opt for freestanding and modular furniture. This versatile solution would freely move the pieces around and in case you have freestanding bath, it will serve as a centre-piece at the heart of your bath-room. Making the most of your current place should be your higher most priority. You might think to save floor space so you can consider mounting cabinets and shelves to ramp up storage. Apart from real space saving solution, you can otherwise apply many tricks to create an illusion of more space. For ex: you can use large format tiles to make the room feel big and avoid any horizontal border tiles that encloses and tightens the bathroom. Finally, you can break up space into various sections with their own vibe and functions. 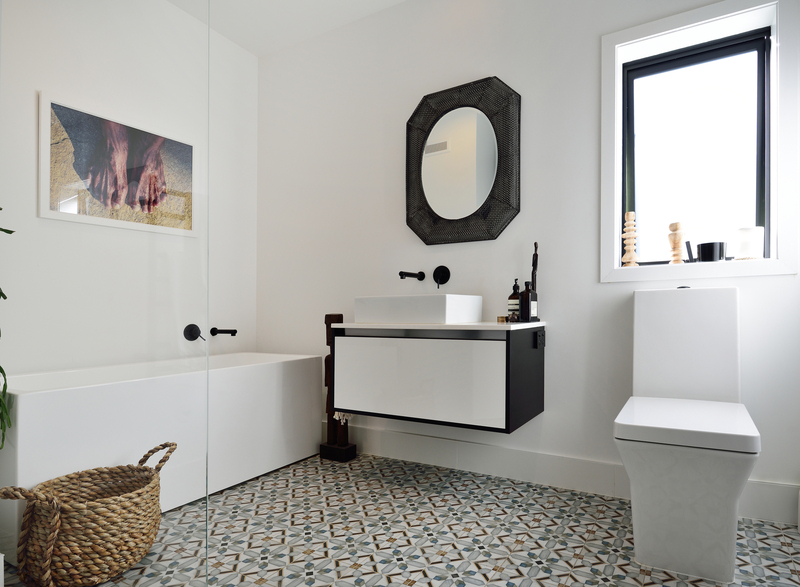 Bathroom tiles usually have some neutral colours because they do easily fit into any style. However, they seem quite boring and for a dream bathroom you need to have something eclectic but elegant preserving your white tiles. Now you can do this by having them embellished with some geometrical shapes to break the monotony. Some darker tiles can create this accent wall and visually expand the space. Additionally, you can cover a wall behind the shower with something varying like a stone or marble which will render contrast to the white tiles and whole area will look warm. Thus, when it comes to tiles, think outside the box and create surprising out of little square that can make a whole out of interesting details. Most of the bathrooms are made up of white colours and so in order to make it shiny, elegant and interesting. You can easily add styles with gleaming details like shiny handles on your vanity. Repaint them into silver or gold to match the faucet head and shower. One more thing you can do is through brass bottles for your soaps, shower gels and shampoos. You can even find a whole set for your vanity vessel including tray, tumbler, soap dispenser and add sophistication in the form of brass. Bathroom looks complete and elegant with a vanity, but they can also be used for other purpose. Choosing a bigger, smaller or vanity made up of wrong material will sometimes leave you at problem. Therefore, you should always measure a few times before picking the vanity and look for sustainable materials that can endure all humidity of the bathroom. In the similar way, you can pick a design that could please you and with darker colours it can render contrast to your white bathroom. In order to create a stunning visual impact, designate a statement wall that could feature contemporary designs. You can use bold colours and patterns here and make large or stylish mirror to add additional decorative theme. All this can add shimmering flavour and make the space appear more spacious. You can even incorporate luxurious sensation, spa-like features and personal touch to your bathroom provided there is enough fund and space. So, whatever you do, don’t dive without a plan and budget. Check the latest trends and leave a personal mark by assembling sense of style to your bathroom. The quick guidelines and tips will surely help you renovate a beautiful yet sensational bathroom that could increase the style and bring a welcoming odour. Apply these current tricks to shower multiplied generous sophistication to your beautiful bathroom.